Loading firewood from the trailer to the truck. Yesterday morning EJ and I got another load of firewood from our friend RB’s place. We just put the wood into the back of the pickup truck rather than try to pull the trailer home. Today’s wood was heavier–we took the lighter pieces yesterday–so EJ did most of the work. I moved the ones that I could. 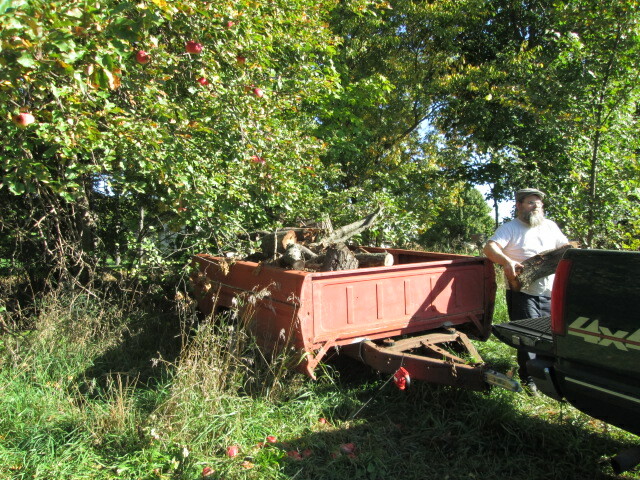 We picked a couple more apples, but this time I guarded them so Danny couldn’t steal them. They were tasty. 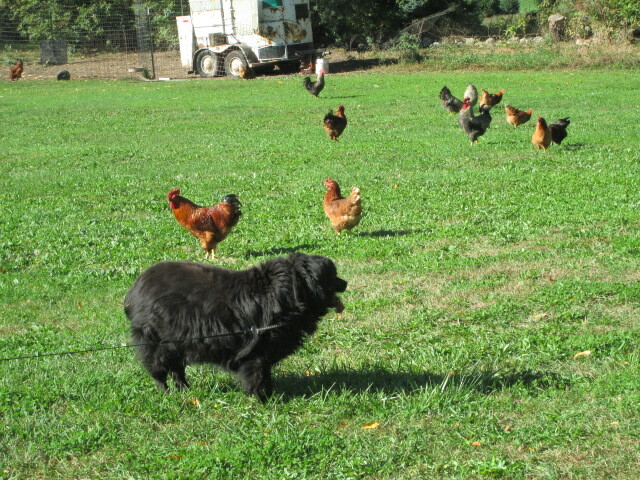 Danny calmly observing the chickens. The day was beautiful so we took Danny along with us. I didn’t want to risk Danny running away in unfamiliar surroundings and I wasn’t sure how he would react to the chickens so I kept him on his leash. His leash is retractable and long so he could wander a little. He was pretty calm around the chickens. He occasionally looked at them but didn’t get excited about them. When we got back home, EJ and I unloaded the firewood. Then EJ dragged out the junk steel we wanted to take to the steel place today. I fixed lunch and then I spent most of the rest of the day working in my garden. I am planning to change my gardens a bit for next year, maybe take out some ground cover and planting edible plants or veggies. EJ and I discussed where we would plant a couple of dwarf apple trees and some blueberry bushes. EJ reminded me that blackberry leaves can be used to make tea, so I cut back some of the bushes and stripped them of their leaves. I began to dry them in our food dehydrators yesterday, and worked on it some more today after I had finished all my other tasks. This morning EJ and I loaded the steel into the truck and then we (and Danny) drove to the steel place. They buy steel. We drove up on a scale and they weighed our truck. Then we drove to a spot where we threw the steel stuff out. When we emptied the truck, we drove back onto the scale and the difference between the full truck and the empty truck is calculated. Then EJ drove up to the office and was given money for the steel. The old microwave, lawnmower, and water heater we got rid of gained us $21.88. On our way home, we stopped at a home improvement store. EJ bought a fence panel and gate hardware so he can make a gate. He will complete this project when he has time and a sunny day. We got home just in time to make and eat lunch. Then it was off to work for EJ. After JJ got home from college, I took Danny to the vet. He suffers from skin allergies at this time of year so he needs a shot to stop his itching. He already had a shot a few weeks ago, but he started scratching again and I could tell he was feeling very miserable again. As soon as Danny and I walked into the vet’s, Danny peed all over the floor. He has never done that before and I felt bad about the mess, but the staff said not to worry about it, it happens frequently. While the vet was giving Danny his shot, he asked how all our cats are doing. 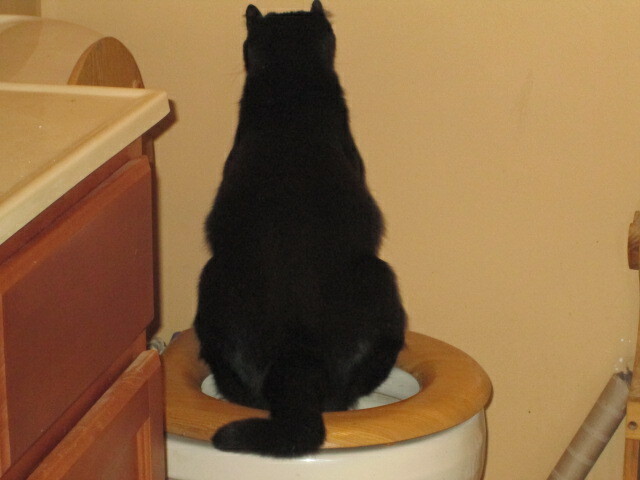 I told him about Luke teaching himself to use the toilet. He thought Luke was a genius to teach himself to use it. I think he is pretty amazing too.